The Stratford Room is named after Stratford Hall, Robert E Lee’s ancestral home located in Westmoreland County, Virginia. This stately room has lovely antique furnishings including a magnificent queen size canopy bed. 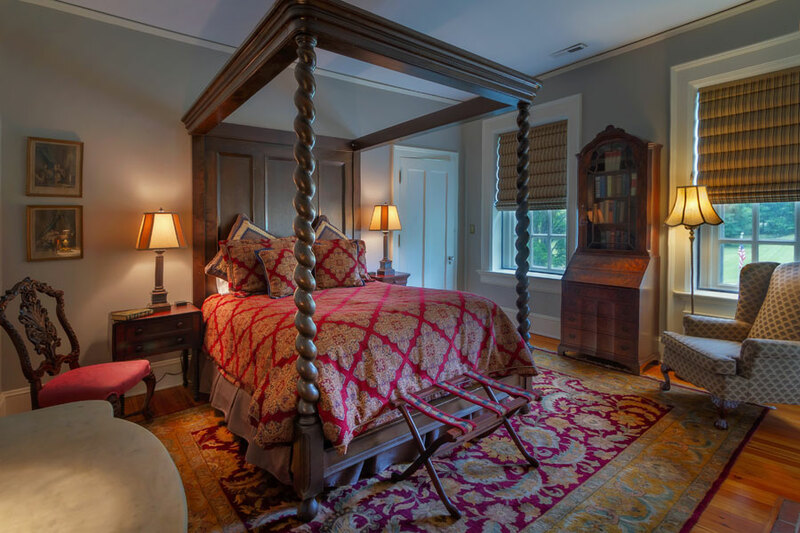 The room has a spacious en suite bathroom with antique fixtures including a claw-foot tub/shower combination and fireplaces in both the bedroom and bathroom. This is a second-floor room and is not accessible to guests with mobility limitations. A hearty breakfast in our stately Dining Room overlooking the Blue Ridge Mountains (Gluten-Free, Vegetarian and Vegan options available upon request). A game of pool in our Billiards Room featuring an original 1898 Brunswick Billiard Table. Relaxing on our majestic Rear Portico marveling at unparalleled views of the Virginia countryside and Blue Ridge Mountains. Shopping in our Tavern Lane Antiques Store for antique furnishings, lighting and vintage costume estate jewelry. Relaxing or Reading a book in one our many beautiful Common Areas.